Nancy Johnston is one of those sort of dark horse competitors. She seems so quiet and unassuming, but get to know her a little bit and you’ll find she’s a fierce competitor, with a lot of race finishes under her belt. Quick with a smile and and modest to a fault, if you’re from Whistler, you’ve surely seen her around town. Nancy was kind enough to take time out of her busy schedule to answer some of my nosy questions. Tell me a little bit about yourself, outside of sport. Originally from Ontario, I’ve been in Whistler for nearly 23 years. I work with a great, supportive group in the Bylaw Department for the RMOW. I have 3 sisters, 2 brothers. We grew up in St Catharines with a pool in our back yard. I learned to swim and loved to race anyone who would jump in. But that was for fun. Growing up my sports were all team sports, ice hockey, basketball and field hockey. A friend of mine wanted to give triathlon a go so I signed up. It was Kelowna Apple Tri in 1996. I borrowed a bike, it was really hard and I loved it. It was so much fun. After sprints and Olympic distance races friends convinced me I could go longer. Victoria half Iron was my 2006 goal. On my second lap of the run I swore I would never run more than 10k again. Since then I’ve done Oliver half iron multiple times and Muskoka 70.3 IM wasn’t an easy decision I knew it was going to take a lot (time, money) but I lined up after watching IMC 2008 and with the support of family and friends and guidance of my trusted coach Christine Suter, I crossed the finish line. Not sure it is excitement I am feeling. I don’t know why but I am nervous. Maybe because it is a month early? My goal for the race is to really enjoy the day, smile, thank as many volunteers as I can. With a few lingering injuries I don’t want to focus on a time, I don’t want to be disappointed. I’ve only done a few running races. With a few lingering injuries more racing just wasn’t in the cards. How did you find training through the winter months? I love the training so I’m okay with the long winter in the gym, pool or on my bike in the living room. I also got up the hill once or twice a week for a bit of cross training. How do you fit in life, work and training? Are you able to find balance or did “something have to give”? My coach gets me program for the week I schedule everything and it all fits in. Just trying to sort it out on the fly doesn’t work. Balance is key and overtraining is a big risk. 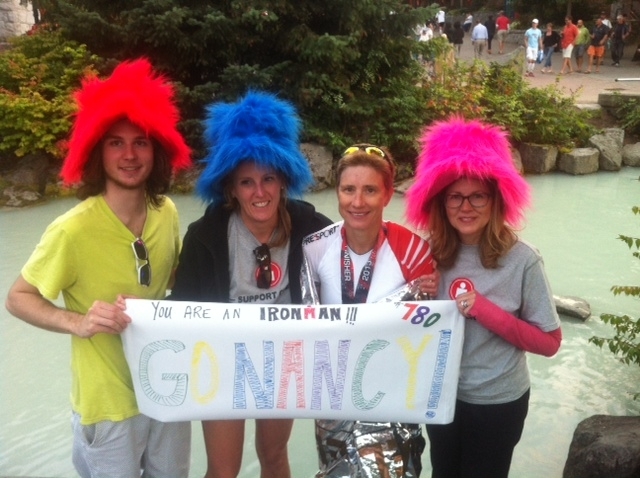 My biggest strength on race day last year for sure was friends, family, colleagues cheering me over the entire day. The support was overwhelming, it gave me a lift when I needed it and that was a lot, especially on the run. Which brings us to my weakness, the run. It’s not just running (although my hips and knees are not happy about running these days) it is usually the state of my gut by the time I’m about halfway through the run. I ran a pb at the UBC fall classic this past November. Getting older and faster, I was stoked. I love training with my friends in Whistler, and meeting new people who come here to train and race. I am not a big fan of cold water or starting my ride in the rain, it’s ok once I’m out there and it rains but starting in the rain? Doesn’t happen for me. Hugs, Hi 5s, and West Coast Float. Worth running to the line for! Greg Sandkuhl, Christine Suter and Maridee Fitch. I have had great days swimming, biking and running with all three, motivating and fun. Primary recovery needs to happen right away, get in cold water, Vega recovery protein, rehydrate. Then the fun begins beer, chips, pizza (gluten free please), feet up. Next day, go Float 650lbs of Epsom salts; does the trick. 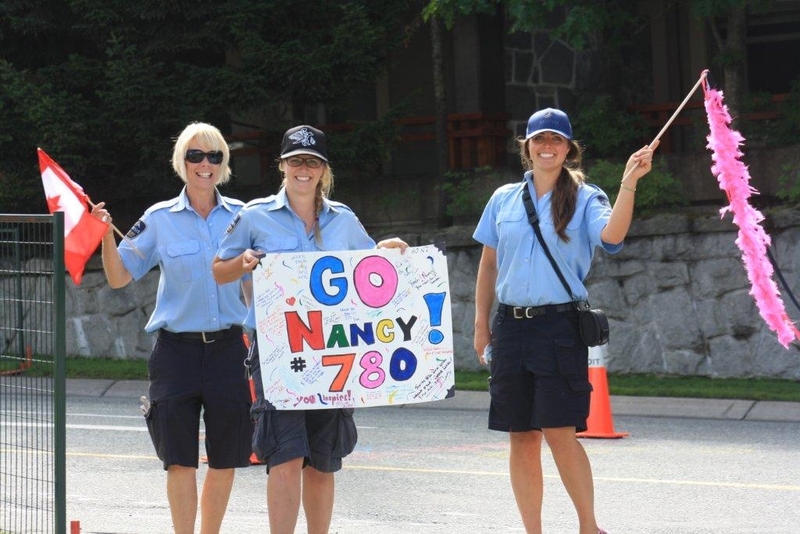 Thanks Nancy, I’ll be at the finish line to give you a hug and a high 5! You’re on your own for floating.